The recent debt debacle in Greece has partly triggered the recent correction which saw markets worldwide declining by as much as 10%, besides other causes such as the increased regulations proposed on US banks and China's tightening measures. 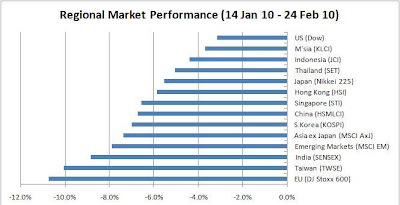 The worst performing markets are EU & Taiwan currently. DJ Stoxx 600 declined 11% from its high in mid Jan 2010 followed by TWSE decline of 10%. KLCI, as expected, was rather sheltered from the onslaught by dropping a mere 3.7%. In addition, EUR has dropped against major currencies such as USD and Yen by 5.9% and 9.5% YTD. Is the Greek crisis a major cause for concern at the moment for the equity markets? I believe the market has hyped up this issue too much and the correction seen now is overdone and should be temporary. Here, we'll just take a closer look at the debt concerns in EU. Greece debt levels came to the limelight owing to its high debt levels revealed after the government revised its fiscal deficit for 2008, raising questions on the transparency and accuracy of its accounts. By 2010, its fiscal deficit and debt/GDP levels will reach 12.7% and 113% respectively, much higher compared to the EU's SGP (Stability and Growth Pact) standards which requires EU members to adhere to its fiscal deficit and debt/GDP limits of 3% and 60% respectively. Its debt/GDP level is also the highest in Eurozone and 2nd highest in terms of fiscal deficit after Ireland (Eurozone's fiscal deficit and debt/GDP at 6.9% and 84% respectively in 2010). In addition, its economy is expected to remain in the negative in 2010 before turning a small positive in 2011, raising concerns over the sustainability of its economy and its ability to repay its debts. About EUR 17 billion worth of Greek bonds will be maturing mostly in 1H 2010 and whether Greece will be able to pay the loans is in question. Small impact apparently: Nonetheless, note that Greek economy is just a very small portion of the EU, accounting for just 2.7% of Eurozone's GDP. On top of this, Eurozone's overall debt levels are relatively lower as compared to US (Fiscal Deficit: 11.6%; Debt/GDP: 93.6%) and Japan (Fiscal Deficit: 7.1%; Debt/GDP: 227% - Massive!!). This will be a precursor to the destruction of the single EU currency which they have taken years of painstaking efforts to unite. It would be more costly for Greece to exit from EU as it will have to fend for itself without the EU umbrella. Its currency will be devalued, alleviating its foreign debt even higher while at the same time borrowings will be extremely costly for Greece. Rather hopeless apparently. Its plans for budget cuts were met with strong opposition with strikes across most sectors and public unrest on the streets. Corruption is too deeply entrenched in the system and there is too much political baggage to head off any fiscal consolidation efforts. This will be the most likely outcome. EU member representatives have pledged to step in to provide financial aid to Greece should the need arises, likely in the form of guarantee for Greek bonds and extending low-cost lifeline to banks with Greek exposure especially Greek banks. Nonetheless, European commission (EC) authorities will have to assume a supervisory role over Greek's economy by imposition of conditions on Greece to regularize its economy. Greek's financial autonomy has to be diluted. Furthermore, Greece could be the 'Lehman Brothers' of Europe where Greek's debt risks will cascade through the financial systems of other EU members. 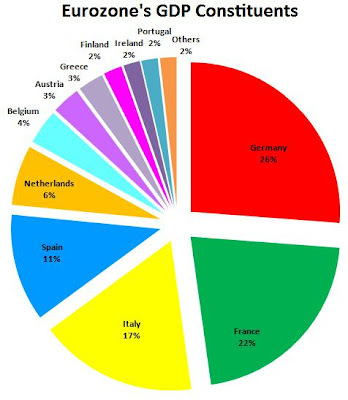 Greek government bonds are widely held by Greek banks which are used as collateral for loans from ECB and German banks are known to have substantial holdings in Greek bonds and bank debts. Should Greek economy collapses, the domino effect could be severe throughout EU. EU cannot afford to have this kind of crisis to occur. Greece is still under the Eurozone. Any crisis that happen within the Eurozone, EC is obligated to solve it and not having authorities outside of EU to assist. IMF's financial aid package could be costlier at the same time. Spain, Ireland and Portugal are countries which are put in the spotlight as well over its ballooning debts. However, the conditions of these countries are not as severe as Greece. Spain and Ireland, though having a high fiscal deficit of 10.1% and 14.7% respectively, are stronger in their fiscal position as their debt/GDP for 2010 will just be at 66.3% and 83% respectively, therefore allowing more fiscal flexibility to boost up their economy. On the other hand, Portugal's economy is much smaller which contributes about 1.8% to Eurozone's GDP. Its bonds maturing in 2010 are expected to amount EUR 5.9 billion while fiscal deficit and debt/GDP will be 8% and 85% respectively. In other words, its small economy is easier to be handled. EU will come to the rescue if Greek economy fails. Might not even need assistance in the short term if bond issuances are proved successful. Nonetheless, Greece will need to regularize its economy by imposing austere budgets to ensure its economic sustainability. However, the country is plagued by public backlash, massive corruption and structural weakness, rendering its efforts to steer the economy out of recession toothless. There have been talks of severe contagion effects of sovereign defaults on EU economies and the moral hazards arising from financial aid given to Greece. However, I think these two risks will be low. Firstly, EC cannot afford this crisis to blow out of control and therefore will help its troubled members. Secondly, if financial aids are given out, EC will be imposing strict controls on Greece and the country's financial autonomy has to go. If the members wish to exercise their autonomy, they will have to put their house in order. Moral hazards will happen only if members are not disciplined for creating such chaos. Overall, valuations of EU are cheap, trading at PE of 12x and 10x for 2010 and 2011 respectively. Corporate earnings growth will be 25% and 20% for 2010 and 2011 respectively. Investors will steer their attention back to earnings which will be key driver of markets once the debt concerns subside. Investors might consider buying into European equity funds to take advantage of the current correction.